The quilt arrived and it is absolutely wonderful! My husband - who was somewhat skeptical of this whole project - was also obviously impressed by the quality of the quilt. I can't wait to see my son's reaction when he opens this gift. I've been showing off the quilt at work to many oohs and aahs - including one of my co-workers who is a quilter herself. Thank you for your meticulous attention to detail and willingness to accept a last minute addition. 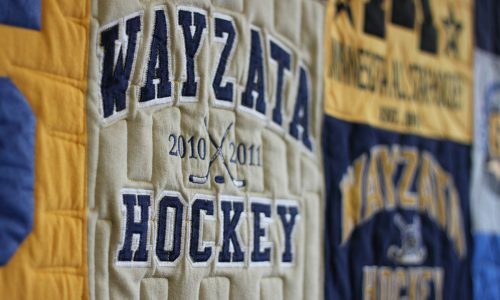 This is a beautiful keepsake quilt. Thank you. Thank you. Thank you.